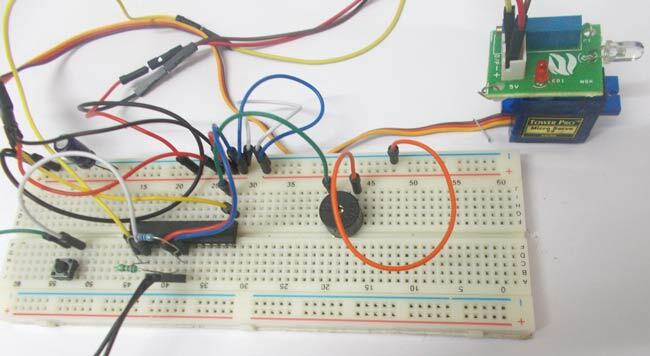 In this project, we are going to make a Fire Alert System using ATMEGA8 microcontroller and fire sensor. Fire sensor can be of any type, however we are using IR (Infrared) based Fire Sensor. Although IR based Fire Sensors have some disadvantages mostly of inaccuracy, it is the cheapest and easiest way to detect fire. IR Based Fire sensors have lesser sensing vision, so we are going to mount the fire sensor on a servo motor. The Servo will be making 180 degrees pendulum rotations. With the Fire sensor mounted on it, we get a 270+ degrees fire sensing vision. The servo will be rotating continuously thus giving a complete room fire alert system. For more accuracy we can add a smoke sensor to the system. With that we could get higher accuracy. Hardware:+5v power supply, Servo motor (sg90), ATMEGA8, BUZZER, Button, 10KΩ resistor, 1KΩ resistor, 220Ω resistor, 100nF capacitor, AVR-ISP PROGRAMMER. For the servo shaft to move left all the away we need to give 1/18 turn on ration, and for the shaft to rotate all the way to the left we need to give PWM with a duty ration of 2/18. We are going to program ATMEGA8 to give out a PWM signal which will rotate servo shaft to 180 and then to 0 after a certain delay. In atmega8 for three PWM channels, we have designated three pins. We can only take PWM output at these pins only. Since we are using PWM1 we should take PWM signal at OC1A pin (PORTB 1st PIN). As shown in the circuit diagram, we are connecting the servo signal to OC1A pin. Here another thing is over three PWM channels, two are 8-bit PWM channels and one 16-bit PWM channel. We are going to use a 16-bit PWM channel here. Here we are going to keep everything simple, So we are going to use FAST PWM method to generate the PWM signal. First to choose the frequency of PWM, This depend on application usually, for a LED any frequency greater than 50Hz would do. For that reason we are choosing the counter clock 1MHZ.So we are choosing no prescalar. A prescalar is a number which is so selected to get a lesser counter clock. For example if the oscillator clock is 8Mhz, we can chose a prescalar of ‘8’ to get a 1MHz clock for counter. The prescalar is selected based on frequency. If we want more time period pulses we have to chose higher prescalar. Now to get the FAST PWM of 50Hz clock out of the ATMEGA, we need to enable the appropriate bits in “TCCR1B” register. CS10, CS11, CS12 (YELLOW)—select the prescalar for choosing counter clock. The table for appropriate prescalar is shown in below table. So for prescaling one (oscillator clock=counter clock) . so CS10=1,other two bits are zero. RED (WGM10-WGM13):are altered to choose waveform generation modes, based on the table below, for fast PWM. We have WGM11, WGM12 and WGM12 are set to 1. Now we know that PWM is a signal with different duty ration or different turn ON turn OFF times. Up until now we have chosen frequency and type of PWM. The main theme of this chapter lies in this section. For getting different duty ration, We are going to choose a value between 0 and 255 (2^8 because of 8 bit). Say we choose a value 180, as the counter start counting from 0 and reaches the value 180, the output response may be triggered. This trigger may be inverting or non inverting. That is the output can be told to pulled up on reaching the count, or it can be told to pulled down on reaching the count. GREEN (COM1A1,COM1A0):This selection of pulling up or down is chosen by CM1A0 and CM1A1 bits. As shown in table, for the output to go high on compare and the output will stay high until max value. We have to choose inverting mode to do that, so COM1A0=1; COM1A1=1. As shown in below figure, OCR1A (Output Compare Register 1A) is the byte which stores the user chosen value. So if we change OCR1A=180, the controller triggers the change (high) when counter reaches 180 from 0. OCR1A must be 19999-600 for 180 degree and 19999-2400 for 0 degree. //taking portd as input for input commands from buttons. PORTB|=(1<<PINB2);//is fire is sensed set the alarm. Don't you have programme in bascom language? I dont know c.
Currently we have the program in C language only. what does "i" stand for? What's the IDE you use to program AVR uc ?